Building your own online shop can seem like a challenge. After all, there are so many online stores, making it extremely hard to stand out from the crowd and hope your target audience will just stumble upon you. In 2018 approximately 1.8 billion people purchased goods online worldwide and global e-sales rose to $2.8 trillion. Estimations say that by 2021 a growth of up to $4.8 trillion in e-retail is expected. The past years mobile shopping has been on the rise. Customers visited retail websites from their mobile device most of the time, but people are not only browsing, as there is an increase in actual online shopping as well. By the end of 2018 there were just as many mobile orders as desktop ones in the world. In 2017 11% of online shoppers used their smartphones for shopping on a weekly basis. Despite the enormous number of online stores, it seems only a very small percentage of them generate more than $1,000 annual revenues. With the vast selection of competitors and consumers, companies need to go the extra mile to make sure that the customers will pick them for their online purchases over the others on the market. It is very important to create a clear and distinctive message and brand awareness, but an even bigger part of that is to determine who is the actual target audience and to figure out how to cater to their needs. Even the best message is useless if it doesn't reach the right ears. If you're not careful about how you target your ads, your content risks getting lost in the 2.2 billion global users of the world's largest social media platform. You have to understand the characteristics and habits of your audience first of all. Once you do, Facebook offers powerful tools in getting your message to the right people. Getting the message right is hard enough - what one customer might love, another one despises, so make sure you get your design, wording and imagery right to fit the taste of your audience. You need to look into what you are actually selling - if it is a physical product then the answer is slightly easier than when you are selling services. However when you are e.g. selling nail polish, make sure you are aware that you are also selling a sense of fashion and style, while selling an alarm system will also mean you are selling a feeling of security. How will your product be used? If you are selling sports equipment try showing it pictured on the sports field and emphasize the resiliency and performance enhancing features. What Do You Need to Know About Online Shoppers? Generation X shows an especially strong tendency toward online shopping; they comprise 34% of the total online shopping population, but 39% of all heavy shoppers. “Super Shopper” is a consumer who falls into the top 20th percentile of users based on time spent shopping online. She is a 47-year-old woman with a household income under $50,000 especially interested in Amazon, eBay, Walmart, and Craigslist. Knowing the above characteristics, and combining that knowledge with what you already know about your current customers, is a crucial first step. The next is applying that combined knowledge to the audience section within Facebook's ads manager. Start with demographics that are similar to your current and ideal customers. Explore your options here; you might stay basic with age and geography, or go into detail on income range, gender, and more. Which makes more sense depends on how specific you want to get. Behavioural targeting will be an important category for this audience, as you can target ''Engaged Shoppers'. You can also just easily identify who frequently shops in your area based on this. Also mobile users are just as likely (if not more) to shop online than desktop users. Finally, and especially for this audience, custom audiences should become a crucial part of your Facebook targeting strategy. That includes retargeting, through which you can set up messages specifically to recent viewers of product pages, and even users who have started but abandoned their checkout process. Another option is to build lookalikes; upload a list of current customers for a given product, and target your Facebook ads to other users who share similar characteristics. If you are new to the business though, or you are having trouble building your customer base you might not have a usable customer list for retargeting on your hand. Also while Facebook offers extraordinary insight into their user base – you can find everything from demographics and geographics, to their personal interests and behavioural traits – it can nevertheless be quite difficult to tackle that. This is especially true if you run an online shop, it’s not clear how useful Facebook’s geo-targeting tool will be for you. Age and gender could be useful, especially when you take a look at the statistics, they can also be overly broad and showing your ads to the wrong audience too frequently, or on the contrary, too narrow. An interest-based campaign might be your best bet, there is little guarantee that people are actually interested in the things they proclaim to be interested in on Facebook. To that end, while somebody might like the page of Amazon, that does not mean they ever purchased anything from the site or more on the contrary, people who like to shop online might have never liked the Facebook page of Asos or Ebay. This is where Audience Finder by 42matters comes to the picture, as you can tell so much about people based on what they have installed on their phones. You can build an extremely incisive audience persona by looking into the applications that people download on their mobile devices. For example you can be almost certain, if people downloaded the apps Amazon, Wish or Ebay there is a very good chance they’re interested in online shopping. If they’ve downloaded Asos, Zara or H&M apps they are more focused in shopping for fashion. Step One: Define Your Audience. You probably have a pretty good idea of what your average customer is like. And presumably, you have a good idea of who your competitors are. Use this knowledge to select applications that match this profile. For example, if you try to advertise a general online store, you could target people that have downloaded apps like Amazon, eBay, Wish or AliExpress. 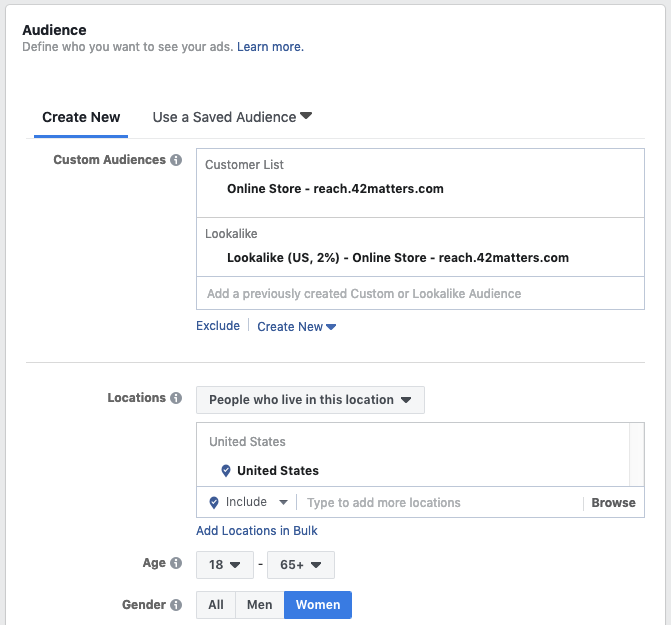 The Audience Finder by 42matters can help boost your online store's visibility by using information about downloaded mobile applications to more reliably identify your customers’ interests. This granular approach to audience targeting is guaranteed to put your advertisements directly in front of consumers no matter where they go. Should you have any questions, we are happy to answer them. Feel free to email us at info@42matters.com. You want to advertise your music event on Facebook efficiently? In this article we show you how to deliver your ads to the perfect audience, and get the most paying attendees with Facebook Ads. An example of how highly accurate audience targeting cryptocurrency works in comparison to traditional targeting options on Facebook. Moreover, also how it can increase the specificity of your Facebook ad targeting.